Image size: 28" wide x 14" height. November 14, 1965, Ia Drang Valley, Vietnam—Amidst the low brush, elephant grass and enormous sun-baked termite mounds, clouds of dust lazily drift away from the clearing nicknamed LZ (Landing Zone) X-Ray. 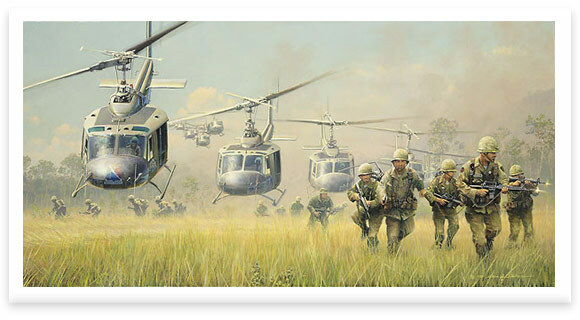 In preparation for an air assault by troops from the 1st Battalion, 7th Cavalry, United States artillery has been relentlessly pounding away at the perimeter of the LZ. At 10:48 the helicopter touches down, and Lt. Col. Moore, Sgt. Major Plumley, Capt. Metsker, Bob Ouellette, Al Bosse and Vietnamese translator Mr. Nik become the first boots on the ground at Ia Drang. Helicopter pilots Bruce Crandall and Ed Freeman would go on to receive the Medal of Honor for their actions during the battle of Ia Drang, a battle which would go down in history as one of the most intense of the Vietnam War. This three-day struggle would later be documented in the best-selling book We Were Soldiers Once…and Young by Lt. Gen. Hal Moore (Ret.) and Joseph Galloway. William S. Phillips compellingly depicts the chaos of LZ X-Ray in First Boots on the Ground. The piece is countersigned by Lt. Gen. Hal Moore, (Ret. ), Lt. Col. Bruce Crandall (Ret. ), (MOH), Command Master Sgt. Basil Plumley, (Ret. ), Bob Ouellette and Al Bosse.